When I was growing up in India, January 14th would bring a sky full of sights to see, loud sounds to hear, and amazing smells of festive food! It is because on this day in Gujarat, India they celebrate Kite Flying Day or Uttarayan or Makkar Sankranti. It marks the end of winter and all around there is anticipation of clear, breezy spring days. In my home state it calls for a celebration and 2 days off of school or work — just to fly kites! The morning of, we would wake up as early as we could to win the best corners of our rooftop terraces, from where we and countless thousands of our compatriots would fill the skies with kites. We gathered piles of colorful, tissue-paper-like kites, and glass coated threads to fly them. The glass did cut your hands, but flying kites was serious competition and serious fun, as you would test your skill in cutting others’ lines with your own. With our kites and threads, with our favorite Bollywood tunes, the loudest speakers we could find, and with chikki to snack on, we made our way up to the rooftop. There is no feeling like it — looking at a colored confetti filled sky, eating chikki, flying kites, all while you take two days off school or work! How better to speed winter away and welcome spring. Now — about the chikki! There are some childhood foods that stay with you forever, and this is one of them for me. My mom would make chikki a day or two before, and I was the happiest kid on the block when I smelt the melting sugar! 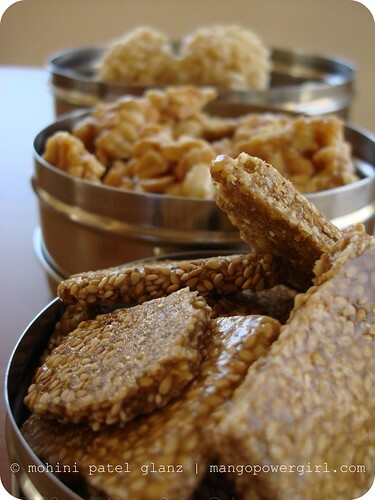 Chikki is a brittle made of: pure Indian cane sugar called jaggery or gud, ghee which is clarified butter, and then there are three common types, with either peanuts, sesame seeds, or puffed rice. You can use Earth Balance for a vegan version of course! I do miss Kite Flying Day so much, and I want the husband to know the flavors I remember. We can’t be in Gujarat today (someday, though!) but I decided to make all three types of chikki. 1. 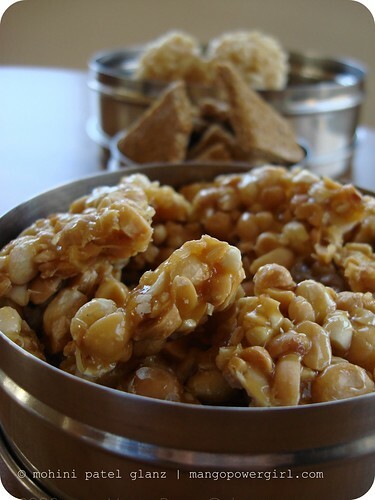 First is the mamra chikki, or puffed rice brittle. Mamra chikki are rolled up into balls so you can hide a rupee coin inside, then give them out to the less privileged as a secret donation. Now no coins are going into my food! So in my recipe, I feature the healthy surprise of a toasted almond 🙂 Mamra chikki are way better than any brand name “rice” treats! 1 cup roughly chopped jaggery/gud. You can replace with regular white sugar. 2 cups puffed rice approximately. You want just enough for a thin coat of sugar. 1. Bake the puffed rice on a baking sheet at 350 F (175 C) for 5 minutes or until it’s slightly crispy. 2. On medium heat, in a non-stick pan, melt the butter. 3. Add the sugar or gud until it melts and bubbles. Stir to make sure there are no lumps! 4. Add the baked puffed rice gradually, and stir quickly to evenly incorporate the sugar into the rice. Take it off the heat, but don’t let it harden! 5. Dip your hands in room temperature water, and shake off the excess. This prevents you from getting burns from hot sugar, a trick I learnt from my aunt! 6. 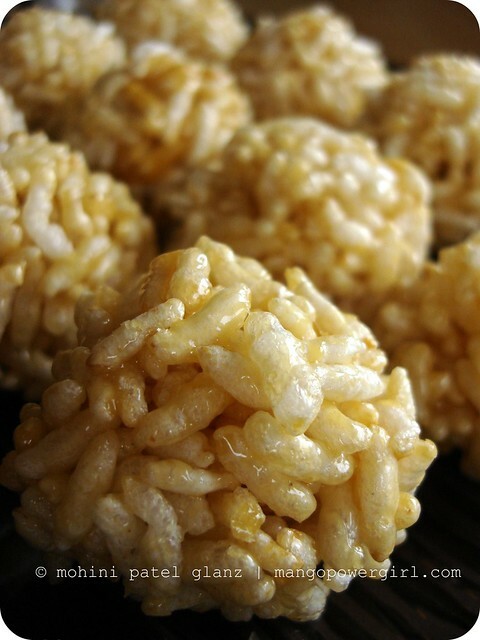 Now take about a 1/3 cup of puffed rice and quickly roll into balls. You size them the way you like, as long you work quickly. You can hide an almond or treat inside as you form these balls. 7. Repeat steps 5 and 6 quickly if you want to roll them into balls. If you’d rather not handle hot sugar with bare hands, set your chikki in a greased baking tray and cut out squares right away. Work with your hands at your own risk, and don’t suffer! 2. Next is the tul chikki or sesame seed brittle, my all time favorite! My mom made this sometimes out of thegud and sometimes out of regular, granulated white sugar. I used regular sugar and it turned out just fine. Here it is! 1 cup sesame seeds approximately. You want just enough for a thin coat of sugar. 1. Bake the sesame seeds on a baking sheet at 350 F (175 C) for 5 minutes or until slightly toasted. 2. On medium heat in a non-stick pan, melt the butter. 4. Add the sesame seeds gradually, and stir quickly to evenly incorporate the sugar into the seeds. 5. Quickly take the soft mixture off the heat, don’t let it harden, and place it on a greased cutting board. For this, a plastic cutting board works better than wood. 6. Roll it out to about 1/3 inch — or whatever thickness you like, but make sure it’s even. 7. 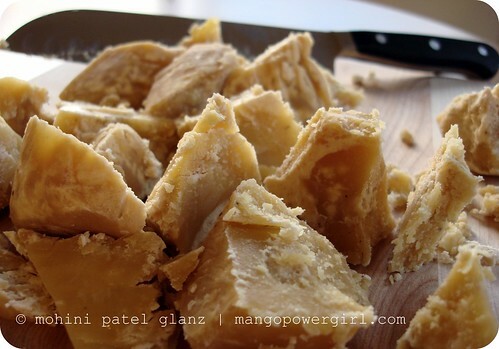 Take a knife and cut squares out of the rolled out brittle. Don’t worry about cutting all the way through. As soon as it hardens, you’ll be able to lift and break it at the point you made the knife marks. 8. In 10-15 minutes the sugar should be hard enough that you can break it into pieces. Use a spatula to lift it off the cutting board if necessary. 9. Store at room temperature in an air-tight container. 3. 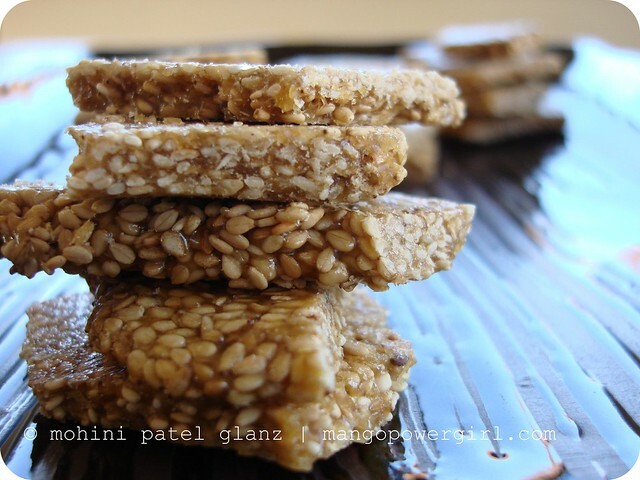 The third type – the singdana chikki or peanut brittle, is is a classic and I know it exists in many cultures. For this, my mom also made it with whichever sugar was available to her. I used the gud again and it was great. You can use pretty much the same recipe as for the sesame seed brittle above. A note I want to add is that from home to home, chikki ingredients were always the same but they tasted slightly different. That was the feeling I got today, too — my chikki tasted like nobody else’s I’ve tried before, yet still it was just how it was supposed to be. For the first time, I feel like I accomplished a traditional dish without having to get a second opinion whether it was good enough — because it was! As the people of Gujarat celebrate the end of winter under a colorful sky, and I anticipate the end of a gloomy, damp winter in Seattle, I am happy to have such fond memories of Kite Flying Day with my 3 kinds of chikki! We did not fly any kites today, but we ate plenty of chikki. Later my mom called from India to say she bought us kites from vendors in Gujarat, as much requested by my husband. We are looking forward to flying those this summer! I leave you with these gorgeous shots of the festival from an Indian Flickr photographer. I found her through this Wikipedia entry which tells you more about the festival of kite flying in India. Mo … this is such a awesome post. No one has written abt utran yet. I used to go every year to Surat n Ahemadabad for kite flying before i was married. Spend the whole day up on the terrace with all cousins and friends and blaring music , and yelling our “kapyo” everytime we got one.Those were the days yaar. Even now my folks have travelled there to keep up the tradition of flying ’em and i’m here drooling over your chikkis. They look fantastic. Frankly i’ve never tried making them, just used to devourer the ones my nani n mami used to make. These look too perfect. Lucky you learnt how to make these. I will surely make these the min i settle down a bit from my crazy travelling. That holidays sounds like a lot of fun – I used to love flying kites as a kid, even though mine never flew as high as I would want them too… :)Peanut brittle is a very traditional “food” here in Brazil, too, especially in June, when there are parties for 3 saints, Saint Peter, Saint Anthony and Saint John; it’s one of the traditional dishes for those parties. Kajal – Thanks for taking time to comment!!! I bet you miss yelling kapayo? O it brings back such fun memories … I hope you make them one of these days.Patricia – Fun to hear about similar traditions in your country 🙂 Thanks for sharing the story on Peanut Brittle – I did not know this one! What a fun holiday! Thanks for sharing with us! Thanks so much for your link to my Flickr set which I’m updating daily at the moment. And what a great way to find your wonderful blog — a gem of a find. I’m drooling after looking at those photos. They all look wonderful, but I confess to being mad for the sesame version. I’ll probably dream about them tonight. I’m taking my own advice and am coming out of the woodwork to comment 🙂 These treats look incredible – I’m a sucker for the sweet and salty combo. my parents are from Gujarat and always talk about their kite flying days so fondly. You brought back nice memories…. WOW! I LOVE the pics in this post- you will probably ban me from your blog if I said I didn’t read a word. But Im really not into cooking, but have great admiration for people who love it & do it as well as you obviously do. This is a superb blog & if I ever my interests turn towards the kitchen, you know which blog I’ll read 1st. You are doing a rocking job here! Vineeta – I don’t mind, and know that at least you appreciate the photos 🙂 Thanks for stopping by. I came across your foo dblog by chance, I must say it is awesome. I love the pictures and you recipes are brilliant.Well done! !